If you are concerned about the possibility of losing your teeth or costly treatments then watch the video below or read on. Yes, I want instant access to this right now! David Snape saves!!! He may save teeth, money, time, and pain, but most importantly, he may save lives. 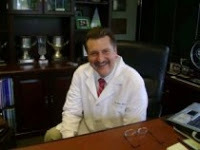 Now that links have been established between the infection of chronic periodontal disease and many systemic illnesses like Diabetes, Heart Disease, Stroke and Low-weight pre-term birth his words are invaluable! 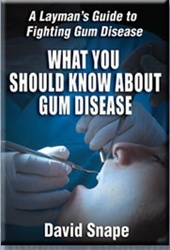 Dave's new guide, "WHAT YOU SHOULD KNOW ABOUT GUM DISEASE" is a great layman's handbook about how to care for your teeth and gums.... "
You want to stop gum disease and save and protect your dental health! Benefit from the experience of someone who has been there and solved his own problem. You'll discover how I was able to solve my gum health problem and avoid the dreaded and expensive (in the US) SRP or 'deep cleaning' treatment. If you have been told you could lose your teeth, this information could be worth thousands or more to you. My improvement was verified by my dentist - the same one who had previously told me that NOTHING would help except that treatment. Turns out there were things I could do for myself and I figured out what they were. Now, you can learn and benefit from what I discovered too! You want information that will help you solve the problem of gum disease, keep your gums healthy from now on and keep your teeth in your mouth for a lifetime of good service! Doctors are busy and they often focus on expensive treatments rather than simple fixes. 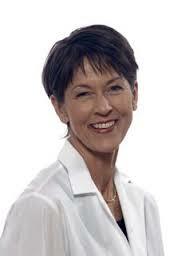 Of course, you always want to be under the care and guidance of your dentist or periodontist. Your dentist or hygienist will easily be able to tell you if you have made improvement based on the measurements of your 'periodontal pocket depths'. (fully explained in these e-books) They will tell you if they have shrunk to a reasonable level or not. You can objectively find out if what I share helped you through your own doctor! You'll discover what I believe to be the most powerful tool and method. It has worked better than anything else I know of for the most people - including me personally. You can read this short guide pretty quickly. It gives you the basic information about what you are dealing with and how serious it is. Then, you'll learn about the single most powerful tool out of everything I have tried. This works the best for the most people. Most importantly, I share with you how to use this tool correctly. You will find it easy and simple, but if you get this part wrong, you could sabotage your results. I'd rather see you achieve the best possible results than get 'mediocre' or even no results. That's why I've included this shorter guide in your package. In addition, you can speak to me personally - see below! If you want more information than the quick guide above offers - this is it! This is a much longer book that goes into more details. 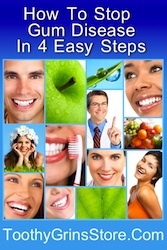 While the short guide above, How To Stop Gum Disease In 4 Easy Steps contains information about the single most effective tool I know of, this book contains a LOT more. There are more tools and products that will help you. But, most importantly, I give you the basic understandings and reasons why these products and tools are beneficial. ​As they say: "Knowledge is POWER"! Get powered up! 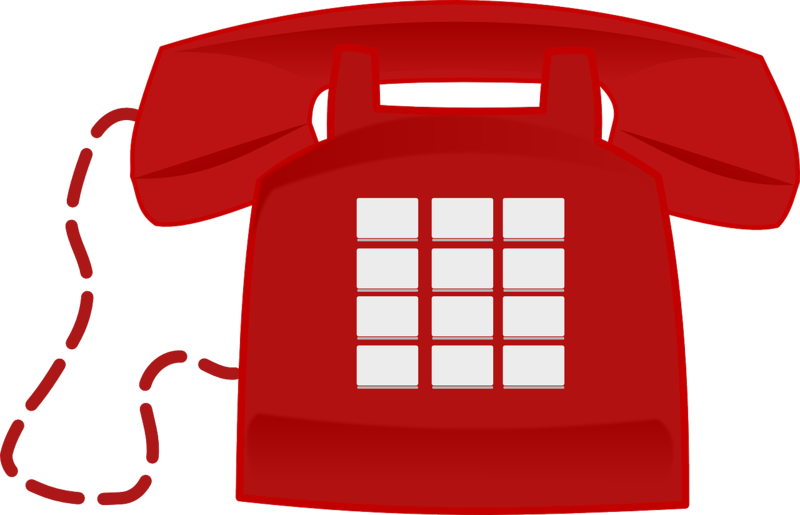 As a customer of mine, you are entitled to a free optional bonus phone call with me, personally! The phone number to use is on the download page after you check out. I'll be glad to talk to you and share with you my understandings and experiences. This bonus is reserved for those who purchase this package from this page. ​You can call me and schedule a call or maybe we'll just have a spontaneous conversation if we both have time at that moment! ​I want you to have the best chance of success with this information and that is the reason I'm willing to do this for you! ...I am personally convinced that they work. I don't need anymore proof than what I have personally experienced. I really am grateful for your information. I was initially skeptical but am a true believer now. Thank you!" 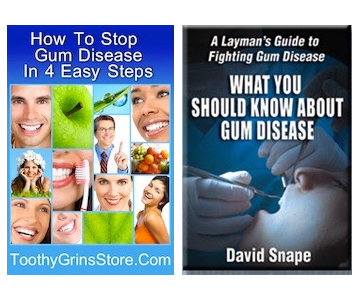 Dear Dave, Thank you very much for your invaluable information about the treatment of gum disease. As I said before, using some of your products has made a huge difference to my gums, my teeth look whiter, gums are pink and less puffy and there has been no more bleeding at all? and of course my breath is fresher even in the morning..."
This book should be in dentist and doctor's office waiting areas and health clinics for the poor and working poor. 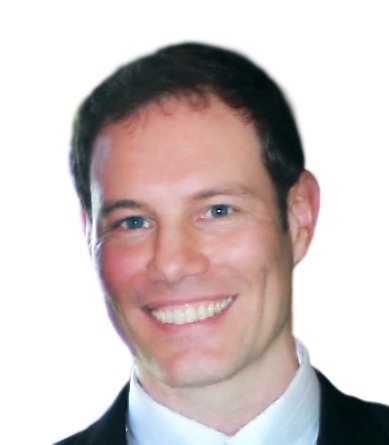 He is respectful to the importance of Dentists and Hygienists in their role in helping people achieve good oral and systemic health, but also helps inform the public how to be better patients! Definitely a valuable book to have handy on everyone's bookshelf!...." 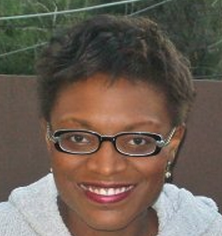 ..."I am a Dental Hygienist who has been in practice for over 33 years. I want to commend you on your information. It is great and I hope it reaches out to many, many people. I am a very good hygienist, both as far as my clinical skills and communication skills, but I know very well that the answer to people keeping their gum disease under control is really, mostly in their own hands..."
Don't leave your dental health at risk for a moment longer! Get this inexpensive but valuable information right now. The cost is minimal but the impact on your life could be HUGE. Plus, you can ask questions of me personally if you would like to! Take action now, because after you leave this page you may not be able to find it again. You will have instant access to this information in just a few moments, including an email with access details. So get started right now. * This site is for information purposes only. If you have or think you might have gingivitis, gum disease or any other health problem, see your dentist or doctor for diagnosis and treatment. The FDA has not evaluated the information or opinions about any products on this page or in the book.